Horizon: Zero Dawn was easily one of the best games 2017 had to offer, so getting the chance to dive back into the world is inherently exciting and daunting. Could an expansion live up to the quality of the rest of the game? In the case of The Frozen Wilds, absolutely. 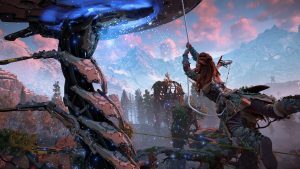 Aloy catches wind of a potential threat in the northern mountains. As she’s known to do, she decides to investigate the situation despite being pretty heavily warned against it. The Banuk people, known as a culture of incredible survivors, are enduring troubling times. An expedition group that went into the most intense parts of the region were all but slaughtered. Even worse, machines are being turned savage and are going off a much deeper end than those being corrupted. After meeting a key Banuk shaman named Ourea, Aloy finds that the machines are being controlled by a daemon. A spirit, potentially not too much unlike what she knows from the game’s main storyline, is in danger from the this daemon. Aloy must investigate what’s going on in the region and put a stop to this threatening Daemon. 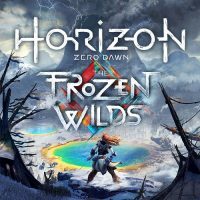 The Frozen Wilds fits very well into the primary storyline of Horizon and provides a worthy plot for you to explore. It’s incredibly effective in telling its story no matter where you may be within the main game. I had already completed Horizon’s primary storyline, but at no point did I feel like the DLC thought I hadn’t or assumed I had. It does a nice job making necessary connections but allowing you to stay in an isolated world that works in its favor. That said, I did feel that you’d be best served to finish the main storyline before jumping into Frozen Wilds, if only because of the difficulty you encounter. The machines encountered in the Banuk regions are a hell of a lot tougher than what you see elsewhere. Most of the machines are going to be familiar but will have the aforementioned savage twist. While tougher, I liked this challenge more than that of the corrupted machines in other parts of the world. It relied on your brute strength that plays very well into the attitude and lifestyle of the Banuk people. It certainly was annoying at times to be bombarded by overpowered machines, but there was still plenty of satisfaction when taking down these even more dinosaur-like machines. To overcome those challenges, The Frozen Wilds offers a new set of abilities to build up through plenty of side missions, competitions, hunting, and general machine killing. You’ll also find yourself collecting and being paid in a new currency called bluegleam. The bluegleam will help you unlock some fancier bows. Other, more specialized weapons were also available through various missions, but I found the bluegleam purchased weapons to be more effective in taking down the machines. And just like everywhere else Aloy travels, you’ll find new text and voice data to give a wider range of context for what’s been going on in these areas. The stakes didn’t come across quite as high as the main story’s data, but it was still enjoyable to find. Without giving too much away, just go out of your way to find the Concrete Beach Party data tapes. You’ll be rocking. The Frozen Wilds is one of those huge DLC packs that the hours of gameplay alone makes the expansion totally worth it. I found myself putting in at least 15 hours into the main story a majority of side missions. The story fit right into the general narrative of the game no matter where you are in the primary storyline. 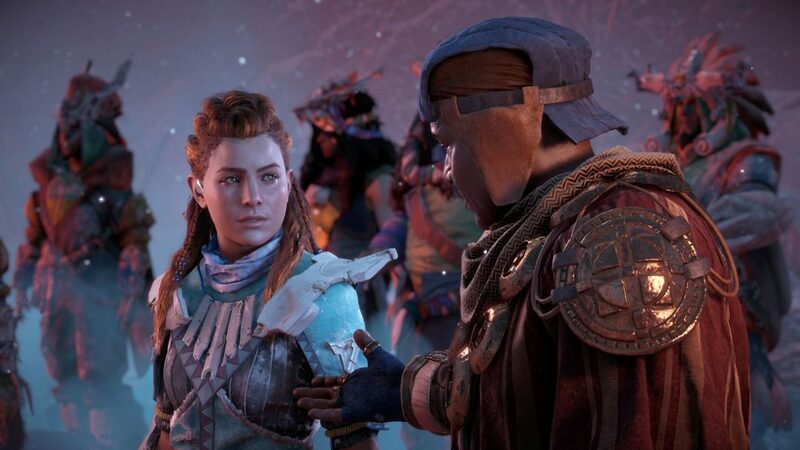 What it does so well is capture a different side of Aloy from what you get from the main story. I definitely recommend picking this up if you’re a Horizon player or are considering picking up the Complete Edition. It absolutely adds a fantastic piece of content to Aloy’s journey. The DLC was purchased by the reviewer. The main story was completed, as were many of the side missions and tasks. Roughly 15 hours were dedicated to the DLC.